When Theater of War was first announced I was working at Codemasters, which was due to be the game’s publisher. The wargame geeks among us were very excited, TOW seemed to offer all the groggy geekiness of Combat Mission combined with great visuals, and we were going to get to see it first! But after some delays the game ended up being published by Battlefront instead, gathering mixed reviews in the process. Six or so years on from those early Codemasters days Theater of War 2 is on the horizon, and I’m quietly optimistic that the problems with the first version will be fixed.So lets see if you also get excited after reading some of the reports out there. First up, there’s an AAR of the Sidi Bouzid scenario over on Wargamer.com. Finally, there’s this sweet quote from the dev log entry on the 25th of January. Just a brief update in the new year! 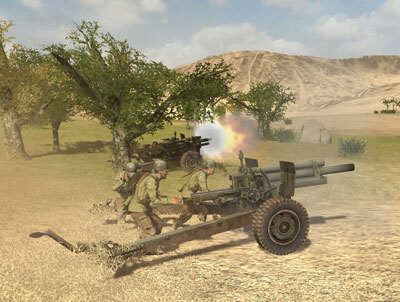 Theatre of War 2: Africa 1943 is now on the final stage of development. Closed beta testing will be finished soon. A big thank you to the beta testers for their input and dedication! Fingers crossed we’ll see TOW2 soon and that it lives up to its promise!